(CNS): The two former leaders of the beleaguered Turks and Caicos Islands have both issued statements criticising theclosure of the TCI Bank Ltd. Galmo Williams, the Leader of the Progressive National Party, who was deposed when British rule was imposed said that he was concerned that insufficient effort was made to save the bank. While his predecessor Michael Misick said the closure was another move by the UK and its installed dictator Gordon Wetherall to dismantle the institutions created to advance the country towards nationhood and to place control of the islands’ economy in the hands of a few white elite British expats. 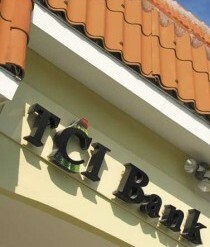 TCI Bank was ordered to close on Friday 9 April. The two former premiers’ statements were posted on the Overseas Territories review website and both condemn the move by the governor. Williams said many Turks & Caicos Islanders had invested their hard earned money in the capital of the bank and it had become a household name and a vital financial institution in the development of these islands. He said he believed the people presiding over the islands do not care about the people or if their money was safe, if they had enough to eat or if they could send their children to school. “If Governor Wetherell and his team meant the people of this country well, they would allow for inward investment to flourish thereby helping investors rather than being a hindrance; they would promote confidence in our country by letting the international community know that the Turks & Caicos Islands is open for business rather than weaving a web of red tape around any idea put forward for investment,” Williams said. Misick also stated that it was ironic that the same week ‘The People’s Bank’ closed, permission was granted to a Cayman based bank to operate a new branch. Dr. Michael Misick is his own enemy and is responsible for what has happened to the TCI. He cannot blame this on the UK, it was all his doing. The UK is entirely blameless on this one. This is what happens when politicians become too arrogant, Cayman beware the same can happen here. Misick corruption had to be dealt with – of course! But this socall "british rule" over the people, has undermined their direct democracy. They elected the man in power. they should have at least had the option to oust him out! "My suspicion that this too is part of a wider British conspiracy to stop at nothing in their efforts to stop the progress of our beautiful Islands and implement their colonial agenda of keeping us poor while making sure the few British elite reap the benefits of our country." Because the Brits are as well full of Misicks! Can anyone prove me wrong??? Sounds like First Cayman Bank all over again and that institution as we all know should have been closed down long before it actually was. The lesson is keep the politians away from the industry.